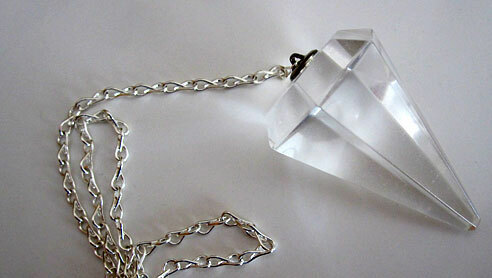 Dimensions (HxWxD): 1.5" x 0.75" x 0.35"
This clear quartz crystal pendulum comes with its own silver chain. It has great clarity and fits easily in the palm. You can see a closeup detail above and the full chain and pendulum just below. Each one is the perfect weight with a tapered and elegant shape. Not too heavy nor too light, this pendulum will bring clarity and light to any question you may ask. 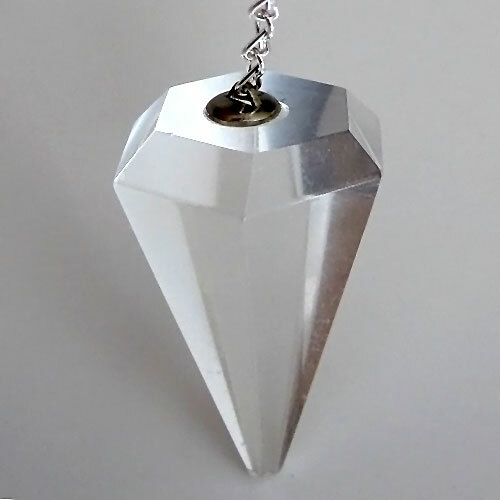 You can be sure that this pendulum will help you attain a clear mind connected to the Divine and obtain a compassionate, answer to any questions you may ask. As with all of our pendulums at Satya Center they come with a drawstring pouch in which to store it. You may find this link useful, it's one of the first 'how to' guides I used to learn how to use a pendulum. It covers working with dowsing, pendulums & more! Called "Letter to Robin", it is available online for free! Sponsored by the American Society of Dowsers. We know you will use this powerful crystal pendulum with loving care and respect its long evolutionary journey deep in the Earth, which has developed its unique metaphysical properties and beautiful appearance. Note: the dimensions are average, each pendulum may vary somewhat in appearance, weight & dimensions. They are all of elegant proportions. This batch of pendulums are ALL filled with light! Each pendulum is guaranteed to be beautiful & to meet with your complete satisfaction! Weight above is shipping weight. Average weight is 10-14 grams. Each piece is unique and may vary slightly in appearance and dimensions. Each piece is guaranteed to be beautiful and to meet with your complete satisfaction.